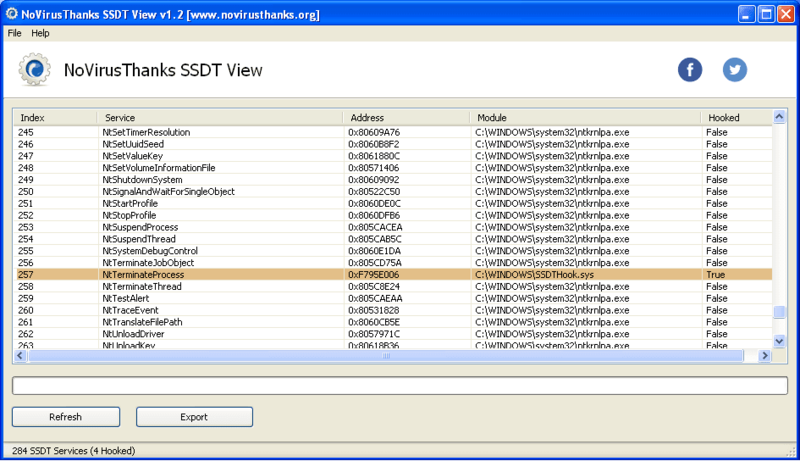 SSDT View is a Microsoft Windows OS utility designed to list the most significant aspects of the System Service Descriptor Table (SSDT) including service indexes, service addresses, service names and the module name which corresponds to the service address. You can export the report to a file for further analysis. This powerful utility can be useful for listing table hooks despite the fact that x64 operating system ships with KPP/PG-ready kernels, which translates to the kernel bugchecking if the SSDT is modified, this can however be disabled through some malware-like tricks hence why this tool has been created. List useful details about System Service Descriptor Table (SSDT). Check which SSDT function is hooked in your system and by which module. Easily export the SSDT scan report to a plaintext file for further analysis.